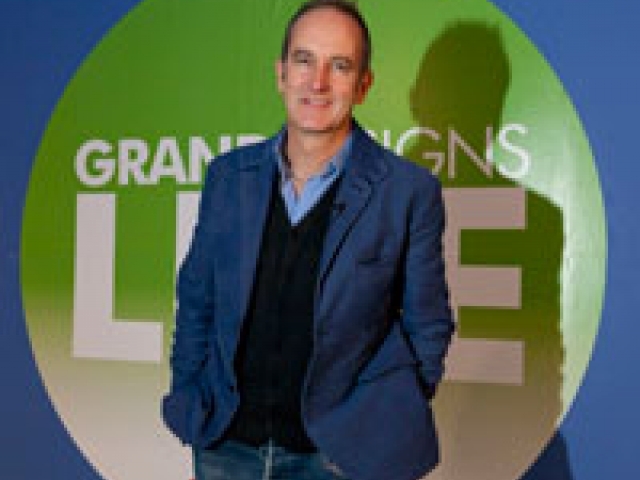 If there's one event that's fast becoming a highlight of my annual calendar, it's Grand Designs Live and the opportunity to a have a peek at Kevin's Green Heroes. a collection of ten designers who have been handpicked by Kevin McCloud for their commitment to both sustainability and innovative ideas. And this year didn't disappoint. From sustainably produced wallpaper to tiles, reclaimed wood furniture to rainwater harvesting, there is something to appeal to everyone who is interested in great eco-design. For instance I love this gorgeous wallpaper by MissPrint, an Essex based business, which uses PEFC certified materials and non-toxic inks. And I think Hendzel and Hunt's chairs, made from reclaimed hardwood and Victorian floorboards, are just gorgeous. I'd love them for my dining room. But when it comes to products that can have a wide impact on waste reduction, the design that stood out for me this year is the Compo food waste digester, developed by Nottingham Trent graduate Oliver Ling. Its sleek design makes it an attractive product for any kitchen and that is crucial for opening up the marketplace to those interested in better managing their food waste. Not everyone has a local authority food waste collection and many people are simply not interested in the idea of bokashi bins or wormeries. However, I can see a whole host of apartment-dwellers and gadget-geeks taking a keen interest in this. What sets the Compo apart from other systems is that as well as creating well-digested compost, its key by-product is actually biogas. Stored in small canisters, an easy collection system is central to its design, allowing its owners to earn money from the fuel generated from their domestic food waste. Of course the message to households should always be to reduce what they can, but a solution like this helps to manage residual food waste and turn it into something useful that benefits the individual, instead of carting it off in trucks. As I declared my particular interest in this to Kevin McCloud, he tempers my excitement with the news that the Compo is still only a prototype. "Green Heroes usually features products that are already available for consumers to buy," he confirms. "However I thought this was such a good idea, I had to include it." And I am glad he did because I can really see a lot of potential here. Having caught up with the designer, Oliver Ling, it became clear that the driver behind the product was his own passion in helping to tackle the food waste problem. The prototype was created as his final year project at university, where he undertook a lot of primary research analysing the contents of domestic rubbish bins. This is further demonstrated in that the Compo is designed to be manufactured from recycled plastic derived from food packaging. "I wanted to design something that was sustainable," Oliver affirms. "In fact, I believe it is so important, every product designer should get involved with sustainability". I couldn't agree more. Designers have immense power to revolutionise the future waste landscape, either through designing-out wasteful and hard-to-recycle materials from their products or in developing new processes and infrastructures that manage our wastes better. I was interested in Kevin McCloud's view on this, especially as there is potential to develop more scaleable applications of the Compo. And having watched his recent series of Man Made Home, which involved the construction of a cabin that enabled him to live off-grid, it was the localised production of biogas that particularly caught my attention. Politely referring to it as "Episode 3", rather than "the one where you cooked on gas made from your own poo", the programme featured a visit to an Anaerobic Digestion plant, which incorporates the collection of dog poo and other materials to create a rich compost and biogas, capable of powering a small village. Kevin wanted to apply this idea to his own cabin experience and in an entertaining fashion set about building an outdoor loo and biogas infrastructure to collect and process human wastes, supplemented by a good dollop of lion dung, which was retrieved from nearby Longleat. "This isn't revolutionary," he insists. "And it's not unproven. In India, for 150 years, people have been building biogas digester systems across the country and lots of villages now have them." Behind the obvious fun involved in building his own off-grid cabin, he was actually keen to explore what was possible, discover what could work in the UK and consider which solutions could be scaled up. "I'd like it to go one step further and connect to the grid," he adds, "Especially as an average family can produce enough methane to cook all its food." However, he doesn't envisage a future where households would have their own individual digesters and personally, despite my fascination for the subject, I feel a certain relief in that. Kevin tells me that the sensible way to do this is on a more ambitious scale, supporting several streets to divert waste from sewage systems into a local biodigester, which connects with the gas main to bring the energy source back into the home. "Currently our infrastructure is national or regional," he says. "We could be considering all those services at a more local scale. Many sewage sites are starting to cover their tanks with methane collectors, but there is potential to create better self-sufficient communities." "The infrastructures for collection already exist but we are very early in the process of transition and it will take philanthropists to influence and direct building self-sufficient communities." "And where society once viewed those who once lived off-grid as green extremists, we are now considering them as true pioneers." The Rubbish Diet Challenge goes on tour! Trashed! An evening in London with Jeremy Irons.